At one point in Boston, oysterbeds were stacked 11ft high and were thriving. These amazing mollusks help clear out nitrates and filter water near eelgrass beds. When tides change, there are long waves that move across the oceans. Gravitational forces, the moon, the sun are all at work. Fascinating tidal pools are revealed or covered depending on the basin of the shore. In this painting the seagrass is exposed laying in the sun. "Uprooted" reflects the precarious balance that the seagrass faces whether it’s been uprooted by storms, dredging, algae blooms, or predators like green crabs digging away at the base of the plant. In this painting I try to capture the transient nature of floating seagrass with transparent light of water reflecting green chlorophyll. This is a green crab that has metamorphosed into a rock. It has become rock. This magical moment actually happened in June 2018 while we were out harvesting seagrass in Anisquam in Glouchester. We spotted a green crab quickly walking sideways in the sand and then just climbing on a rock and it just sat very still. After a few seconds it looked just like the rock. I this painting I was thinking about how all the different elements influence the weigh and material qualities of seagrass. What happens in the the rain? How would the additional weight of water affect the seagrass that has washed ashore. This painting was named "Cnidarians" AKA Jelly fish by Melisa Wong, my ecologist friend from the Fisheries Department of Nova Scotia. She saw jelly fish, I agreed. She also told me that there has been an influx of cnidarians on the Cape and were impacting eelgrass beds. When attending EPA Eelgrass conference in March 2019, we met Mary who specializes in Cnidarians. Mary explained that these jelly fish are toxic to some to the crabs in the seagrass meadows....more seagrass research in Woodshole happening this June- check out blog. Seagrass floats on the surface of an orange shimmered reflection. One of the most fascinating things we can see in eelgrass beds while snorkeling is oxygen being released into the atmosphere. Magical occurrences that just help us breath. I tried to capture this with clusters of connected lines moving upward on the canvas. Marine ecologists test Isotopes in Seagrass meadows to track the food web. This concept reveals the benefits and exchanges that eelgrass meadows provide a wide variety inhabitants. They can test Carbon, Nitrates and Sulfates Isotopes in different different animals which shows the ecosystem services the eelgrass provide.. pretty amazing! Its always a wonderful surprise to find oysters on the Cape. Especially in Orleans where the tides stretch out for miles at low tide. This painting was completed after visiting Barcelona and seeing Flamenco for the first time. It was purely magical, the drama, movement and color has inspired this shape shifting underwater presence. It is seagrass, Comb Jelly fish and Flamenco abstraction. Unusual color variations occur at sunset, capturing imaginary surface flutters of seagrass. When the Fog Rolls In is a more poetic reflection of the colors in seagrass meadows when changes in weather occur. Tangible, intangible, fog brings to our attention to a wealth of sensations that we are not usually aware of. This experience of being engulfed by fog happened on one of my field trips with Alyssa Novak's seagrass conservation group in Wellfleet. One minute we were harvesting seagrass; the next minute the fog was so dense that you could barely see anything. It was amazing since all your senses come alive. Colors are brighter, textures more exaggerated, and the sound almost went up a notch. In this painting I try to capture this tension between dulling down and the unexpected magnification of beauty of the eelgrass meadow. Squished, claustrophobic small movements splatter this painting with strange bubbles that emerge from some choppy small movement. This painting references the mind boggling figures of how one female green crab has 160K off springs!!! The rate at which green crabs proliferate is hard to imagine. This “lots of” toppling around shifted together of crabs comes from my experience of being out in the field and helping count collected green crabs with scientists Alyssa Novak and Peter Phippen. "Bridge to Babel" started with color, line and mark making. As the painting evolved form light washes of diluted oil paint, images landscapes started to appear. Each time I would come into the studio a new shape started to emerge. I worked on this painting in the round, constantly rotating it. The charcoal line appears and disappears at different points creating implied connections from one shore to the next. The title and final charcoal of the unbuilt tower of babel appeared after the elections. My need to reference the importance biodiversity and cultural diversity coalesced in this painting. Solo Show Seagrass: Ecological Engineers at Hess Gallery! HESS GALLERY March- May 24th, 2019 Pine Manor College 400 Heath Street Chestnut Hill, MA 02467 Seagrass meadows are made up of a group of flowering plants that are unique in their ability to thrive submerged in salty seawater. As ecosystem engineers they create habitat and produce food for countless species, sequester a remarkable amount of carbon, and help maintain the health of neighboring estuaries, mangroves, coral reefs, and other ecosystems. They are home to commercial fisheries, which provide food for billions of people. Every hour we are loosing two football fields of seagrass. “Held Together” is an underwater hub where many exchanges occur simultaneously. The organic shapes have edges that become distinct and then shift into the next shape, creating energetic movements. This experience is similar to what occurs underwater when I snorkel in eelgrass meadows, there is this wonderful swaying movement created by lots of micro movements. 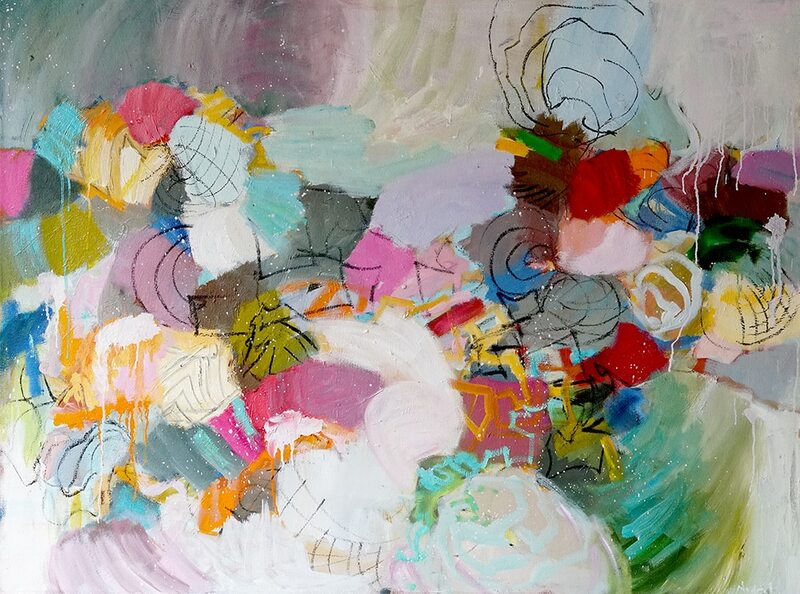 I try to visually capture this rich diversity of colors, shapes and movement in my paintings. This painting is inspired by the wonderful snorkeling experience I had up in Nova Scotia with ecologist Melissa Wong from the Canadian fisheries department. She took us out to remote islands where we could swim in several different eelgrass meadows. Wonderful! In this painting I wanted to capture the raw energy a green crab has for survival. This rose colored world invites the viewers to be a part of the hunt for food where ever the next stop may be. It forges for mollusks such as mussels, clams, scallops and digs away at the base of seagrass beds. If this is a newly established eelgrass bed, it uproots the plant. It’s main mission like other crabs is to stay alive, however it has no natural predators on our coast. I wanted to create this bold movement in a watery invented almost female environment. Graffiti like text forms the structure of this painting mimicking the gone rogue or “Invader” aspect that green crabs have. Seen as outsiders, invaders, these 5 mm small creature can destroy habitats. I use transparent washes along with loud bright marks and impastos to create a push and pull in the painting. I am interested in creating this surface tension and a new type of symbolic seagrass language that is illegible, hard to read or understand, or digest. Seagrass slows down wave action, caused by storms. It helps prevent shore erosion. Turbidity is about seagrass's ability to protect our shores even in the midst of storms. Green Crab Cove, in contrast, is a calm abstract landscape with shimmering light. If the painting is viewed from afar the whole cove becomes a Green Crab basking in the sun. This play on being both object and land happened while I was thinking about how and why the green crab has been here for over 100 years and still is called a migrant crab. At what point do we say “they belong”…or not? The periwinkle is also a migrant mollusk on our shores that came during the 1800s, but it is not seen as an invasive species. Periwinkles were uprooted and assimilated. I used hot pinks and unusual violet colors to describe the beautiful space between the oceans and the beach in “Coastline”. The Charcoal lines mimic organic matter that washes ashore. I used large brushstrokes in alternating patterns to suggest movement of land and water and constant flux of these exchanges. When Tides Flood In, Oil on Panel, 24"x 24", 2017 This painting is about the beautiful reliance seagrass has within natural rhythms of tides in bright glowing light. There is an immediacy of upcoming change, yet a comfort in the daily repetition of the rise and fall of water. Sometimes while you are snorkeling in seagrass meadows you find beautiful movement in plant life that floats by. Please Join us at Monmouth Museum for "Does It Match the Couch- A Juried Exploration of Color". Manatee has been juried in to this exhibition which will run from June 1- Sep. 2, 2018. Monmouth Museum 765 Newman Springs Road Lincroft, NJ 07738 Opening Reception: Friday, June 1, 2018 from 6 – 8pm http://monmouthmuseum.org Manatees are beautiful creatures that live in seagrass meadows and feed off of this amazing ocean plant. We are loosing over 20 football fields of seagrass habitats globally everyday due to pollution. My volunteer work with local marine ecologists in the field help inform my abstract paintings. Manatees are one of the many amazing sea creatures that live in and feed off of seagrass ecosystems. “Sunlit” references the underwater world on a bright sunny day with crisp blue gray reflected light encircling the eelgrass beds in water. I use pencil and charcoal marks to mimic patterns in the water. I used hot pinks and unusual violet colors to describe the beautiful space between the oceans and the beach in “Coastline”. The Charcoal lines mimic organic matter that washes ashore. I used large brushstrokes in alternating patterns to suggest movement of land and water and constant flux of these exchanges. Abstract volumes drift across the top of Floating Rock Crab. Another type of movement is happening on the bottom half of the canvas. Sediment and shuffling of stuff—we are not sure exactly what it is, only that there is a different kind of movement. More packed and dense. In this painting I contrast two types of movements. One is the top water column movement with the leftover floating shells of Rock Crabs. The other movement is that of the hungry Green Crab in the bottom of the canvas: rummaging. This painting is a reflection of the destructive nature of Green Crabs. Native crabs such as Rock Crabs, mollusks and eelgrass beds are being lost at alarming rates. One Green Crab can consume 40 half-inch clams a day, as well as other crabs its own size. This painting references the ever changing topography of sediment underwater. Inspired by seagrass habitats, Bubblegum Somersault references the playful nature of seahorses that live in seagrass beds. Sometimes seen as books or musical keys on a piano this piece invites the viewer to make their own interpretation. Synergy references Bucky Fullers ideas on interconnectedness of elements. How by looking at one part of something like a toe, you would not necessarily imagine the whole person. This idea resonated with me in thinking about the larger context of what seagrass represents; life force for many species. Oysters help clear out algae from polluted waters thus helping clean the waters for seagrass. Great patterns appear and disappear at low tide. This abstract painting show some of the overlapping patterns. Nocturnal ostracod species that conduct nightly bioluminescent courtship displays over seagrass bed and reef habitats. Digging depicts the Green Crab’s process of burrowing through the sediment in seagrass beds. Everything becomes disheveled by the Green Crab’s natural curiosity and resilience—not just to survive, but thrive. They dig away in the sand, uproot the seagrasses, eat through all the scallops and leave empty shells behind. The painting depicts the frantic energy of the “raving mad crab” (Latin definition of Canisus Maneas). I use broken shapes, fragmented lines, and overlapped objects where there is no focal area. This overall patterning creates unrest. The colors are uplifting shades of jewel tones of the somewhat amazing seagrass habitat that is being destroyed. Just like in our gardens on ground, the seagrass gardens underwater start sprouting new leaves in Spring. Ocean Life, Oil on Canvas, 60"x 48"
Currents move between amazing living species in our oceans. Kelp, different types of coral, seagrass, mollusks, fish, thousands of different sea life. Gestural marks mimicking patterns made by the waves. Abstract movements of water at low tide. Ocean Reflecting Sky, solo show at Stetson Gallery September 7 – October 11th, 2017 “Reflection” is an abstraction of an algae bloom, nitrates have seeped into the water and started merging into seagrass’ space. There is still enough light for photosynthesis but the clarity of water is shifting. Nature has an amazing way of dealing with pollution we dump into it, to an extent. Clean water is important not only for seagrass ecosystems that need light to survive but also us. When we pollute our rivers, estuaries and oceans we get algae blooms that block light. This results in loss of costal environments that feed and sustain many species of life, including us. Wispy charcoal lines mixed with golden oil paint suggest CO2 in the air. My abstracted seagrass meadow in the foreground is painted with broad strokes, graffiti like marks and drips of paint. Small amounts of pink reflections poke through the plant like matter. I like to create part ambiguous space, I am interested in the viewer bringing their own interpretation and try to encourage more questions. For example why are 20 football fields of seagrass lost everyday? How is Carbon stored in the sediment? What happens to this natural storage bank when seagrass beds are destroyed? I try to portray the quiet beauty and crucial role seagrass plays keeping our air and waters clean. This abstraction was inspired by seagrass beds at Hadley Point in Acadia National Park. I had trouble finding the seagrass since I wasn't paying attention to the tides. Finally, thanks to eelgrass expert Jane Disney from MDBL who told me to look for the seagrass beds at low tide, everything made sense. I found the seagrass early one morning. A yellow warm haze surrounded all the shelled animals, the air was crisp and the seagrass had just spread it's blades in all directions. In this painting I tried to capture the warm atmosphere of scallops, seagrass and muscles I had found on that amazing summer's day. This is an abstraction of the beautiful life that is encircled by seagrass. The muscles, the crabs, the kelp, the rocks and water. Sometimes my paintings are about the way light hits the surface of the water and reflects different hues. Here in Strange Encounters, the squiggly lines represents organic matter in and around floating seagrass. Sediment is the word scientist use to describe the earth under seagrass beds. Capturing the undulating movement of seagrass blades. Most of the time, I love all sea creatures including crabs. This Green Crab, however is a bit of a puzzle. It's an invasive species brought to the Northeast by Europeans in the 1800 and eats everything and chops away at the roots of seagrass beds. On my trip out to Comono Point with Alyssa Novak's Seagrass conservation group from BU, we planted seagrass and we collected cases of green crabs. They were destroying the newly planted seagrass. This painting shows the tension for survival that exists in our oceans. Seagrass is a wonderful plant that both captures CO2s from the atmosphere and stores it beneath it's root system. When we loose 20 football fields of seagrass a day, we are loosing both services for CO2. Thousands of years of carbon stored underneath seagrass beds become charged with microbial activity resulting in more CO2s being released into the atmosphere. Ocean Above is a contemplation of the invisible properties seagrass holds. This painting depicts the soft sand contrasted with course textures that you may find in the ocean. Ocean life. My paintings are about color and the sensations of light that is essential for seagrass survival. The interconnectedness of a vast number of species sheltered, fed and protected by seagrass habitats is an inspiration for my paintings. Intertidal is about the movement of sea life underwater. As the tides move back and forth, diffused light changes into sharper more pronounced colors. Prior to working in the field with the Novak Lab, seagrass conservation group, I imagined seagrasses lived in beautiful serene environments. After being in the water with pinching crabs, urchins, and other creatures beneath my feet , I got to experience the beauty and the tension of survival in these environments. In intertidal, I try to capture both the beauty and tension between different elements making the community. Inspired by richly dense vegetation around actual eelgrass (seagrass) beds. Watching many living creatures interacting simultaneously is amazing! Better than looking a network or a city with many connections. Sea Hare is an imaginary creature with pink and purple stripes which floats across a celestial dark space. This painting is inspired by a fascinating slug called a sea hare that actually eats algae from seagrass blades cleaning off some of the gunk we put in to our oceans. 20 football fields of seagrass beds are dying globally everyday due to nutrient overload (too much nitrates from fertilizers) & pollution. Hydrochloric Acid is a part of my "Something's in the Water" series. I wanted to create tension between knowing and not knowing; this landscape looks safe but we are not sure. Jarring charcoal lines sweep across the surface disrupting the serenity. This painting references the current oil & gas fracking and how we don't really know what affects the hydrochloric acid has on our oceans, seagrass, and our drinking water in Oklahoma. Biomas is the rich densely populated organic matter near seagrass roots. Love the movement of eelgrass on the surface of the water. Looking through there are multiple layers that are visible simultaneously. Dizzying to think about shoreline erosion, forced migration, and consequences of sea levels rising. Spill is about how we are polluting our waters with both fracking for oil and also the oil spills that occur during the process. It takes 100 years for eelgrass beds to establish themselves. Thinking about seagrass architecture in the spring. High rises, overdevelopment, seagrass architecture. Imaging when sea levels rise how will be resilient enough to grow gardens in our rooftops, while surrounded by water. Movement, light, blades of grass. Sometimes seagrass gets washed on to the shores making these amazing zigzagging patterns. Along with them they carry traces of life that surrounds them. Living creatures like slugs, crabs, or muscles hang on to the eelgrass. Seagrass fluttering on the surface of the water in moonlight. My paintings are about color and the sensations of light that is essential for seagrass survival. The interconnectedness of a vast number of species sheltered, fed and protected by seagrass habitats is an inspiration for my paintings. Reaching is inspired by the amazing phenomenon of aerenchyma, the spongy tissue that forms spaces or air channels in the leaves of seagrass. These air channels keep the seagrass leaves reaching up towards the light and allow for photosynthesis. Immersed depicts an ambiguous boundary between reflection and the invented reality of where seagrass live in this painting. It's a watery abstraction that encircles from one shore to another. In water is about seagrass biomass that grow at the bottom of the shoots. This biomass gets larger fuller and increases in size in healthy seagrass beds and helps with holding down carbon dioxide. It is found that seagrass beds can hold up to 50% of the ocean carbon dioxide in its rhizomatic roots. How cool! "Ever Shifting" is about my experience of being in the field with marine ecologists Alyssa Novak from BU. I was fortunate to go on several field trips and learn how this conservation group harvests and plant seagrass to help with erosion. "Ever Shifting" is my interpretation of seeing both sky, water, and the beautiful diversity simultaneously. The rhythm and movement of many creatures all at their own pace - exhilarating! Working with Novak Lab in Wellfleet when the mist rolled in. Seagrass is a flowering plant. Green Sea Turtles hanging out in seagrass beds. Blue Passage in New Home! Patterns in nature reflecting light. This abstraction came about by out in the water and harvesting seagrass for eelgrass conservation. Sensation of light and water. Imagining how manatees sea their homes in seagrass beds. Macro and micro views of seagrass habitats. Light and the importance of clear water. Snorkeling and sensations of light and energy. Dense vegetation in seagrass beds. Embankments, mangroves, and interconnected habitats. Between Blue is painted on wooden panel to emphasize the textural surface. I started this painting with a pallet knife and modeling paste. I built up a thick layer and started drawing into the modeling paste. The waves lines represent seagrass movement. Other areas have organic shapes drawing into it with a sharp nail. Once this dried, I gessoed the whole surface and started glazing different colors with medium. This was followed by more impasto paint and charcoal line work. This layered process, for me mimics movements of tides. How the tide washes away and reintroduces new configurations. For me this mysterious experience of constant flux and discovery is inspiring. Low tide exposes a new configuration of multitudes. The rich density of life is revealed.